Offering you a complete choice of products which include haynet horse, regular horse hay net, large horse hay net, super hay bag haynet, horse haybag haynet and horse hay bag hay lage net. We have developed a new slow hay feeder that works really well. The feeder is a round bale cover, the tough nets are made to last from durable, pre-stretched, heavy duty polyethylene netting with a sturdy drawstring. The horses can pull the hay through the net while feeding. Thus they get plenty of hay, but the net stops them from pulling out huge bunches of hay that end up on the ground as waste. Slows consumption really keeps those "hay hogs" in check. - Saves time and money. The Extra large size make it very popular and useful among the Big horses. The slow feeder is 225cm when stretched. Or 165cm x 135cm in round bale. You will love these feeders. 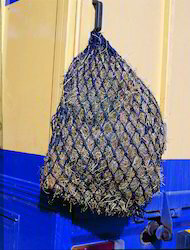 - Haynet comes with 9 Rings at top and one big ring at the bottom to hold the nets properly. - Mesh size is 4" x 4"
A good product for regular use. We Cater to all types of quantites from as low as 50pcs to 5000pcs. We offer samples as per your requirements and specifications. Our products are made from high quality raw material and our Prices are Reasonable and Best in the Industry. Please mail us back with your trade related inquiries. Made from strong nylon rope. 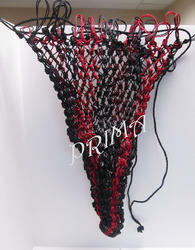 Length 42" and mesh size 2" x 2". Haynets have 18" Rings at top and thus provides wide opening. Big ring at the base to properly hold the haynet. 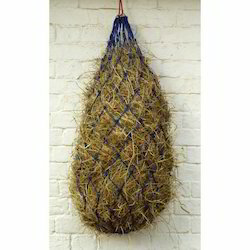 This large haynets also acts slow feed haynet for your horse when you require controlled feeding. Our prices are reasonable and highly competitve in the Industry. We cater to all small and Big quantities of haynets. We can provide you 3000-5000pcs on monthly basis. Please mail us all your trade related inquires. 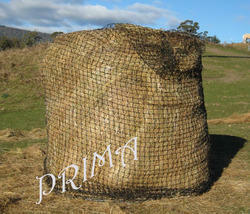 - Small mesh size 1.5" x 1.5"
Very much suitable for slow feedng of Hay. We can supply you 1000pcs-2000pcs on monthly basis. Kindly mail us your trade related inquiries. 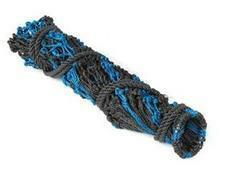 - Made from strong nylon rope. - Available in Length 42"
- Available in Mesh square size - 2" x 2" and 3" x 3"
- No. rings at top. We offer reasonable pricing and our prices are highly competitve in the Industry. We cater to all small and Big quantities of haynets as per your order quantity. - Small mesh size 2" x 2"
We can supply you 2000pcs on monthly basis.